Pomegranate and walnuts are popular ingredients in Georgian cuisine. 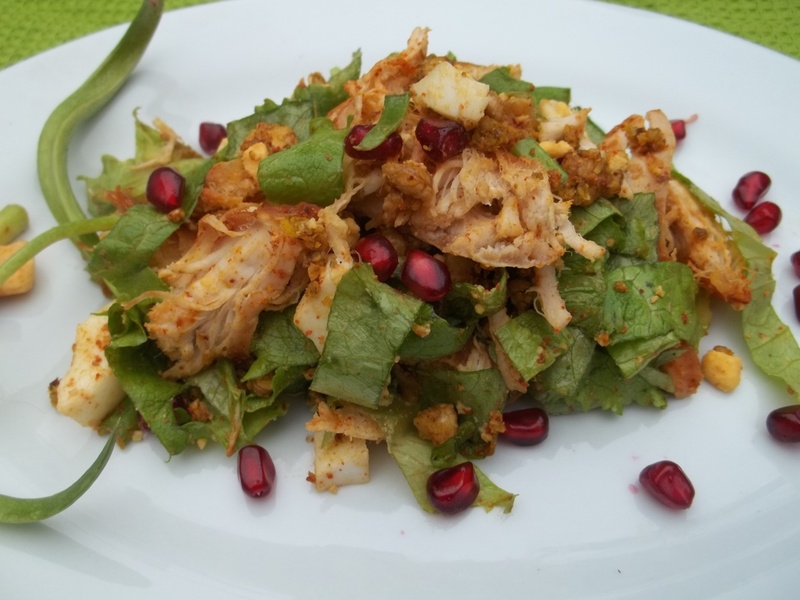 In this family recipe we show how to make a chicken salad with walnuts and pomegranate seeds. 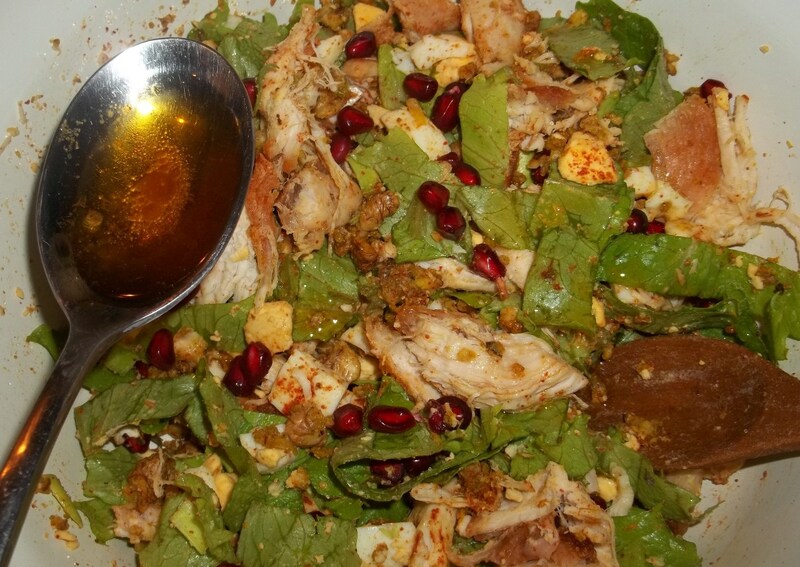 Ingredients: 600 grams of chicken breasts, 200 grams of salad leaves, seeds from half a pomegranate, 3-4 green onions, 4 cloves of garlic, 100 grams of walnuts, 4 boiled eggs, 1 level tsp of dried marigold, 1 level tsp of dried coriander, half tsp of blue fenugreek, 1 heaped tsp of dried red pepper, salt (amount dependent upon personal preference) and 7 tbs of oil. 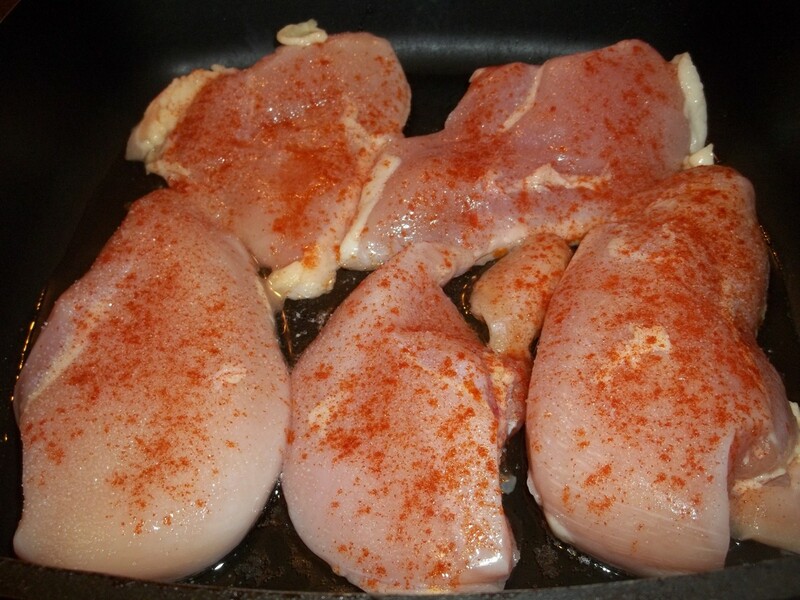 Preparation: Sprinkle the chicken breasts with a quarter tsp of red pepper and salt and fry in 7 tbs of oil on a medium to high temperature for up to 20 minutes (until crispy), turning halfway through. Keep any juices that are left after frying the chicken. Chop the lettuce and add to a mixing bowl. Cut the fried chicken into pieces and add to the bowl. 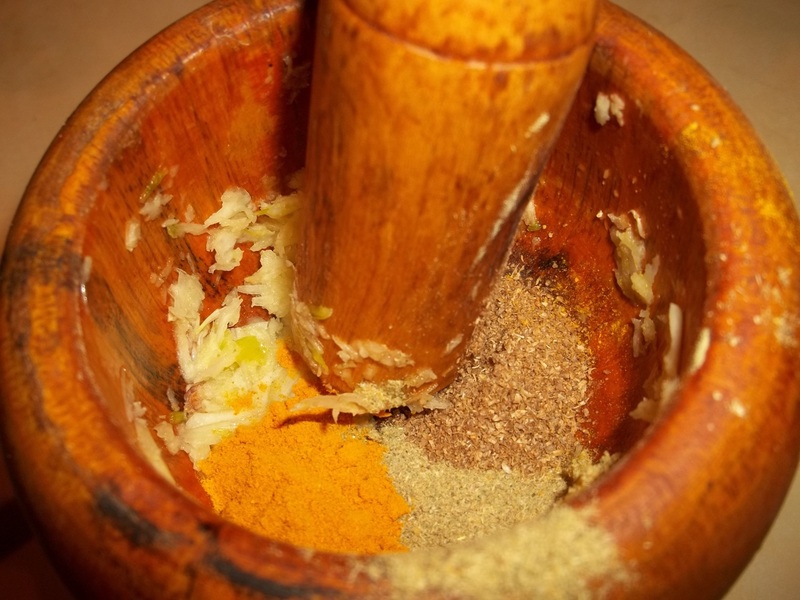 Use a mortar and pestle to crush the garlic and spices. 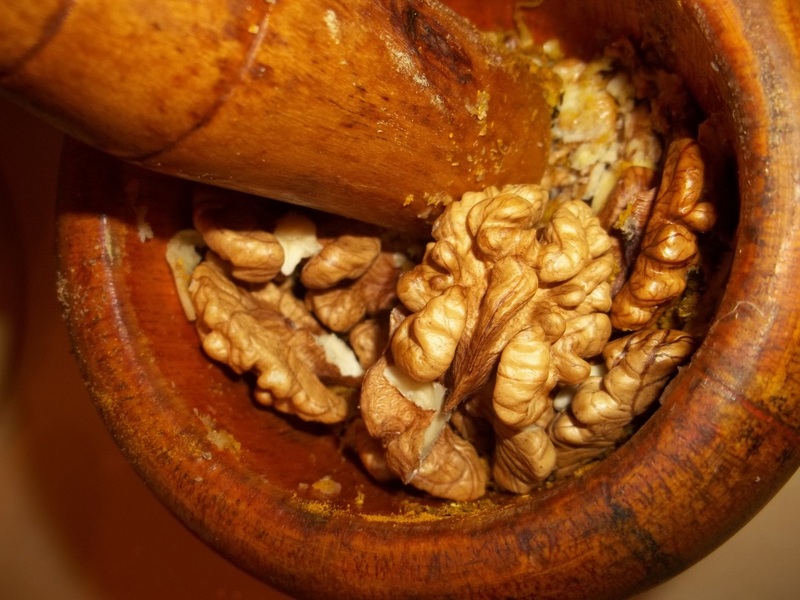 Add the walnuts to the mortar and crush together with the garlic and spices. 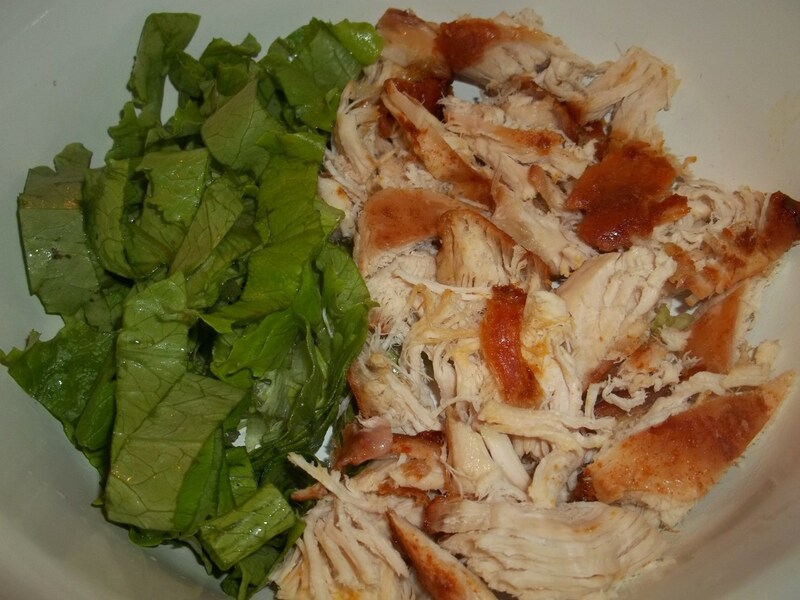 Add the crushed nut/garlic/spice mixture to the mixing bowl containing the fried chicken and lettuce. 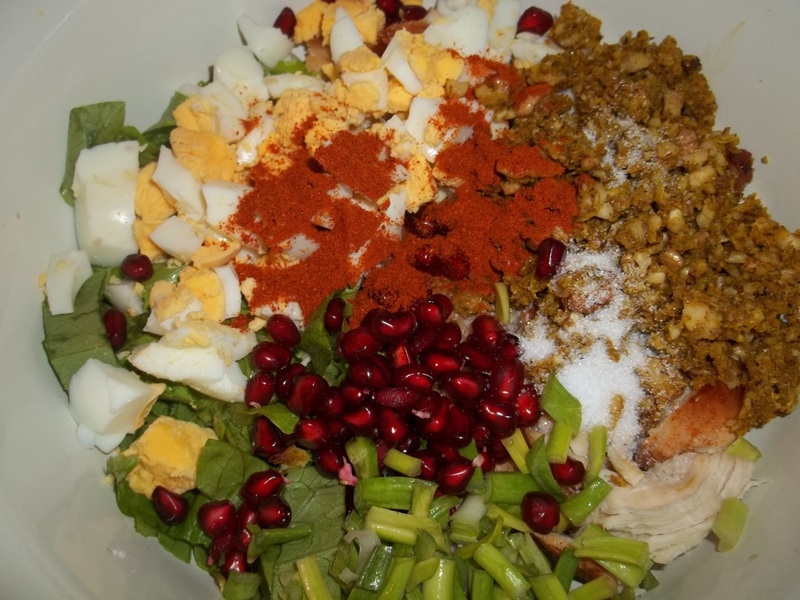 Add chopped green onions, 4 chopped boiled eggs, the remaining hot red pepper, pomegranate seeds and salt (amount dependent upon personal preference). Mix thoroughly. Add 3-4 table spoons of the juices left over from frying the chicken. Mix thoroughly. 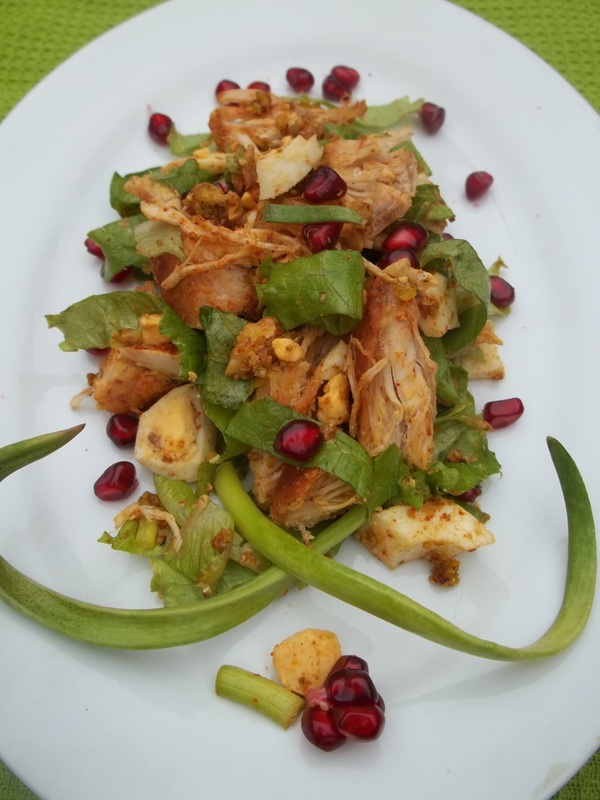 Enjoy your Chicken Salad with Walnuts and Pomegranate!